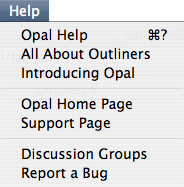 Be sure to check out “Opal Help” in the Help menu — this document is searchable. Help > Introducing Opal may also answer some questions. There’s also supplemental documentation for more recently added features. Finally, many items have tooltips. What machines does Opal work on? Opal is a Universal build (PowerPC and Intel), and runs on Mac OS X 10.4 (“Tiger”), 10.5 (“Leopard”), 10.6 (“Snow Leopard”), 10.7, 10.8, 10.9, and 10.10 (“Yosemite”). Some features require 10.5 or later. We use Opal every day, and will make sure it continues to work, once Apple phases out 32 bit support. US $32 (or the equivalent in your local currency). If you’ve purchased our Addressix envelope utility, you can get a discount. You can also purchase in Japanese from Stands Co.; the price is 3980 JPY. Click here to look it up. What happens after the 30 day free trial? Your free evaluation ends 30 days after you first try Opal. You will still be able to open (and even edit) any outlines you created, but you won’t be able to print them or save any changes. Because you don’t need to buy Opal in order to view an outline, you can send Opal documents to any other Mac user, and know that they can open them. Yes, it uses the same WebKit routines as does Safari. Does it read Acta outlines? Yes. Sound annotation and publish & subscribe information aren’t used. Typestyle information is converted, but you may need to have Classic fonts installed so that Opal can identify them. Will it output Acta outlines? No; it’s difficult to output Classic-style font information for many modern fonts. Opal is great, but English is not my native language. Will there be a ___ version? Opal is localized in Japanese as well as English. Contact us if you’re interested in helping create a localized version. We don’t like to say much about future releases, since timetables can be so uncertain. But we will be taking advantage of some of the new features in Mac OS X 10.5 (Leopard). Can you make Tab indent? Will there be a Windows version? What about an iOS version? Unfortunately, the routines used to save and restore exist only in Mac OS X. Why aren’t Expand and Collapse just one menu item? There’s a preference (Combine Collapse and Expand menu items) in the Interface tab which may be useful if you seldom use multiple selection. How come the keyoard equivalent for Split Daughter doesn’t work? The Dock is taking precedence. Choose Apple > System Preferences, click Keyboard & Mouse, then choose the Keyboard Shortcuts tab. Disable (or change) the keyboard equivalent for Automatically hide and show the Dock. First, be sure you’re running 10.4 or later — we’re taking advantage of its better compression. Second, be sure you’re opening the .dmg with DiskImageMounter (ctrl+click or right+click on it and choose Open With...). This utility is at /System/Library/CoreServices/DiskImageMounter.app, should you need to navigate to it. Finally, be sure it’s a .dmg file! In some cases, it seems to get an extension of “.dmg.bz2” (but is otherwise the correct size). If so, rename it to end in just “.dmg” and it should open. Opal is distributed as an Internet-enabled disk image. According to Apple, “After a user downloads an Internet-enabled disk image from a network using a web browser, the image is automatically opened, its contents placed at the user’s download location, and discarded (in the Trash).” Safari performs these steps for you if you’ve enabled its Open “safe” files after downloading preference. See how to submit feedback. Please let us know. What is Opal? Opal is a trademark of A Sharp, LLC. Mac and the Mac logo are trademarks of Apple Computer, Inc., registered in the U.S. and other countries. Copyright ©2018 A Sharp, LLC. Last updated 14 May 18.